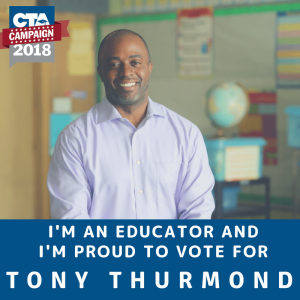 Here’s a collection of articles that will help anyone interested to see why I’m enthusiastically supporting Tony Thurmond in his bid to become California’s State Superintendent of Public Instruction. I’ll be writing more later, but this will give you plenty to read if you’re doing some research on the candidates. I’ve met Thurmond a few times, and will just add one thing that doesn’t come through from all those articles: he just gets it. If you’ve ever had a conversation with someone about a topic where you have both expertise and passion, then you know when you’re talking to someone who shares your knowledge and dedication. Thurmond had many years of experience as a school social worker before entering politics, and you can tell that his personal experiences as a student, parent, and social worker have informed his career as a policy maker at the school district, city, and state level. Read on, and vote for Tony Thurmond!